Miller's Mountain men appear to be very similar in appearance. While there is some variety it's not much. The amount of detail depends on if you're looking at a sketch or a larger more finished painting. Their dress is definitely influenced by that of Native American dress coupled with everyday type clothing. 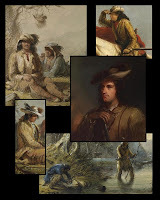 The collage of figures taken from a very small sample of paintings shows how he saw or at least depicted Mountain men. In addition to Miller's paintings I'm also going to be using a modern day "sketchbook" that focuses on the clothing and other details that are sometimes hard to decipher using reconstructions done with line drawings.